Article originally appeared on RappNews on December 27, 2016. The author is Roger Piantadosi. Former Rappahannock County administrator John W. McCarthy will start the new year on the staff of Piedmont Environmental Council. “We’ve made him an offer and we’re moving forward,” said PEC President Chris Miller on Tuesday, confirming the report that appeared Monday on fauquiernow.com. Both he and McCarthy, who retired in June after nearly 30 years as the county government’s chief administrative and zoning officer, said the details are still being worked out, details that include salary and a job title — though McCarthy said his job title would likely be along the lines of senior policy director. “I’m feeling every bit of the ‘senior,’ I don’t really know yet about the rest yet,” McCarthy quipped over the phone Tuesday. PEC, founded in 1972 to promote and protect the Virginia Piedmont’s rural economy, natural resources, history and scenic beauty, is headquartered in Warrenton — where McCarthy and his family have lived for 20-plus years — but it has offices throughout the nine-county Piedmont region that includes Albemarle, Clarke, Culpeper, Fauquier, Greene, Loudoun, Madison, Orange and Rappahannock counties. “We started talking about it in September,” said Miller. “John was excited that we could sustain such a position, and the initial possibilities of that are what we’re working on now. Many of the issues PEC takes on, from the environmental impact of electric-grid expansion and budget-related threats to statewide land conservation incentives, to watershed concerns — a particular focus today being the upper Rappahannock — “are becoming more complex,” Miller said, “in terms of finding the right balance, the solution that communities are willing to accept. The nature of issues is no different, but what the solution is — that’s becoming more challenging. A great example is around telecommunications. It’s a very high priority for people to have cellular and broadband, but how you provide that is complicated. . . . Both Miller and McCarthy said McCarthy won’t really be replacing anyone among the organization’s staff of about 30, that his addition to the staff is part of a slight restructuring of existing staff. Miller said he hopes PEC will have McCarthy on board early next month, working with staff, local governments in the region and on statewide issues. McCarthy started in 1986 as the county’s first-ever zoning administrator, and administrative assistant to the board of supervisors. The board two years later appointed him county administrator. 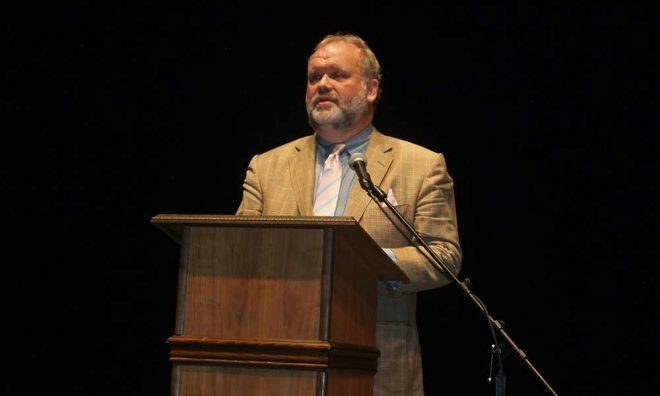 He earned a master’s degree in planning from the University of Virginia and got his bachelor’s degree in geography from Mary Washington College in 1984. Over his tenure in Rappahannock, McCarthy has served on many organizations’ boards and government committees; he is now the PATH Foundation’s board chairman. From July until just this month, he’s been working as interim director of the Northern Virginia 4-H Educational Center in Front Royal.